So few Angelenos voted this year that Eric Garcetti was elected mayor with just 222,300 votes — the same number it took to get elected mayor in the 1930s, when L.A. was half its present size. 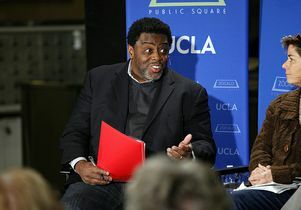 At a “Thinking L.A.” event Thursday co-presented with UCLA, local political experts talked about why Angelenos are so reluctant to go to the polls, whether it matters and what might change things. From the left, Dean Franklin D. Gilliam Jr. of the UCLA Luskin School of Public Affairs talks to Tracy Zeluff, Fernando Guerra and moderator Joe Mathews about why many Angeleons don't vote. 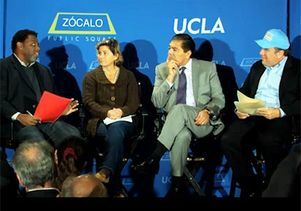 Among the panelists gathered at Grand Central Market were UCLA Luskin School of Public Affairs Dean Franklin D. Gilliam Jr.; political scientist Fernando Guerra, who directs the Center for the Study of Los Angeles at Loyola Marymount University; and Tracy Zeluff of GroundWorks Campaigns, a veteran L.A. labor and political operative. Zócalo California editor Joe Mathews, the panel’s moderator, opened the conversation with data to demonstrate the underrepresentation of the L.A. electorate. Demographically, L.A.'s voter turnout lags 33 years behind the composition of our population. While the city is roughly 50 percent Latino, the voting population was a little less than 25 percent Latino — the same percentage as listed in the 1980 U.S. Census. 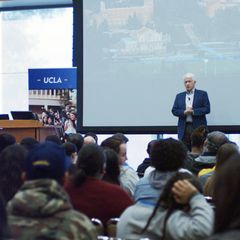 Dean Gilliam said that a conversation about L.A.’s apathy must have historical context. This is a city with a reform government, he said: high-interest and low-interest races don’t share a ballot, a weak mayor is paired with a strong city council, and nonpartisan elections keep political parties out. However, “in our attempt to keep corruption out of politics, what we’ve also managed to do is keep the electorate out of politics,” he said. Participation also spikes in Los Angeles when there’s a contest for power between groups. The 2013 mayoral election saw two “moderately liberal white candidates,” said Gilliam. In the past, turnout has spiked when ethnic groups have battled each other, as in the races between James Hahn vs. Antonio Villaraigosa and Tom Bradley vs. Sam Yorty. People pour energy into a campaign — like Barack Obama’s — hoping for change, and when it doesn’t reach their expectations, they get cynical, and they stop showing up, Zeluff said. Guerra of Loyola Marymount University has studied the attitude of Angelenos toward their city for decades. Recently, he’s found that while people feel better about race relations, they’re not optimistic about the city’s future. Mathews asked Guerra if this pessimism is behind low voter turnouts. Guerra said that there are two grand theories about why people don’t vote. One is that they’re so disaffected they think they can’t make a difference. The other is that they’re not disaffected enough, and, since they’re generally okay with the status quo, they feel they don’t need to vote. That said, in 95 percent of elections, an increase in voter turnout doesn’t make a difference. Only in close elections — like the 2000 presidential race — is turnout an issue. And voter turnout makes a greater difference in local elections than in state or federal contests. But this year, even if there had been a vastly increased turnout, Garcetti still would have been elected mayor, according to Guerra’s projections. However, in two city council campaigns, a greater turnout would have changed the results. So how do we increase voter turnout? “I could, tomorrow, double the turnout by simply changing the election to the presidential election,” said Guerra. But getting attention for a lower-level campaign is difficult; people know less about local candidates and may even stop voting as a result of “ballot fatigue,” he said. The quality of precincts is also an issue in L.A. At one Westside precinct, said Guerra, who runs exit polls as well as precinct quality checks, there’s valet parking and croissants while people wait. At other precincts, he’s seen “Beware of Dog” signs and dogs loose on the property. L.A. elementary school principals also have the power to decide whether their schools serve as polling places or not, which seems arbitrary. Gilliam said that there are many things that can be done to increase turnout — from online and same-day registration to polling place regularity. But “people don’t go to the polls to flip a coin,” he said. You need a real election, good candidates, and strong campaigns for people to show up, which, he said, were missing from this past mayoral election. And even if we get another 5 or 10 percent of voters to come out, what will happen? Is it all, he asked, much ado about nothing? No, said Guerra. Sure, almost all the time, the candidate we expect to win will win. But 2 or 3 percent of the time, we should be able to make the surprise victory happen, he said. Gilliam said we should be concerned about getting the poorest voters out and connected to government. Zeluff agreed, adding that engaging young people, working-class people,and people of color is critical — although voting is not the be-all and end-all of political engagement, she noted. As the panel neared its end, Gilliam and Guerra returned to the most recent mayoral race. Gilliam said that nonpartisan elections make all the candidates run for the middle. He offered his respect for Mayor Garcetti and his opponent, former City Controller Wendy Greuel. But Gilliam said that neither is progressive. Does L.A. deserve better? Could someone like New York Mayor-elect Bill de Blasio win here? Guerra countered that Garcetti has the education, the experience, and the background — all the formal credentials — to be mayor of L.A. Greuel too shares these qualifications. Guerra said that one of the greatest things he saw in this election was a white woman from the Valley campaigning comfortably in South Central L.A. and East L.A. 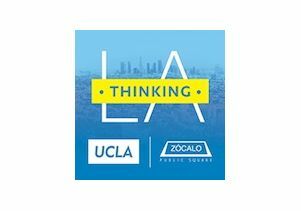 Thinking L.A. is a partnership of UCLA and Zócalo Public Square. This story was adapted from one on the Zocalo website. A video of the discussion is below.